The Dong people are one of the 55 minority people groups of mainland China. According to the 1990 census, there are about 2,514,000 Dong in China. They live in remote mountain valleys along meandering streams in Guizhou, Hunan, Guangxi provinces of southwest China. Some Dongs also live in Hubei province. Dong communities living in different areas vary considerably in both customs and traditional clothing styles. The Dongs wear clothing made of home-spun and home-dyed cloth. Dong women wear simple clothes mainly in green, blue, purple and white. Some wear tight trousers and high-shouldered blouses with big silver or pearl buttons, and some prefer knee-length front-buttoned blouses with narrow sleeves, and an apron covering the chest, short pleated skirts, waistbands and leggings. Others like loose-sleeved blouses buttoned to the side, or long skirts covering the knee and aprons. On important occasions women wear chokers of many strands, necklaces, bracelets, rings, earrings and silver ornaments of fine and decorative designs. References to the Dong can be found in Chinese historical sources as far back as the Qin dynasty (221-206 B.C.). The Dong are believed to have originated from a branch of the ancient "Luo Yue" people and are known to have lived in Jiangxi and Guangdong Provinces during the end of the Eastern Han dynasty (A.D. 25-220). Today the Dong may be classified into two major groups, the northern and southern branches. 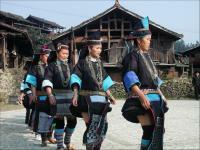 It is the southern Dong, from the remote southern areas of Guizhou, Hunan, and northwest of Guangxi, who have retained the most of their distinctive culture. Linguistically, the Dong belongs to the Zhuang-Dong branch of the Sino-Tibetan family. Although a very difficult language to speak due to its 15 tonal variations, the Dong language is the primary means of communication for the people. Dongs have their own spoken language, but use the Han characters for writing. In the 1950s, the government worked out a Dong written language on the basis of the Roman alphabet. However, the Dongs continue to use Chinese characters, in their written communications.There are basically two dialects, northern and southern. The Northern Dong is under the constant impact of Han culture and has lost many of their traditions, whereas the Southern Dong is able to retain their culture. The Dong grow timber trees, which are logged and sold. Tong-oil, lacquer and oil-tea camellia trees are also grown. Agriculture is another major occupation. In irrigated fields and on steep mountain terraces, the Dong grow rice, wheat, millet, maize and sweet potatoes. The most important cash crops are cotton, tobacco, rapeseed and soya beans. The Dongs tend to cluster by families or as clans in villages. These villages may contain anything up to 600 families and a typical village will consist of families having only one or two surnames. The Dongs are essentially an agricultural society. Before 1950's, cousinship marriage is widely practiced in Dong society, which means according to family rules a girl is obliged to marry her uncle's son (on her mother side). Apparently, this was not healthy for the Dongs so that the local government persuaded them to get rid of the custom gradually after Liberation. Traditionally, the Dongs treat their guests to a specialty drink called youcha, or oil tea, prepared by pouring boiling tea into bowls containing a mixture of such ingredients as glutinous rice, fried peanuts, soybeans, chopped green onions, spinach, lean meat and so on. When ready, the first bowl of oil-tea must be presented to the eldest or the most distinguishing guest at table, and then to other guests and the host family. In fact, oil tea is not a pure tea but a gruel of five flavors - salty, bitter, pungent, sweet and aromatic. It has a refreshing effect besides satisfying hunger and thirst. After sharing the oil-tea, the host will usually invite the guests to join the singing and dancing around a fire. The Dong have an unusual custom of planting 18 fir trees when a child is born - these trees become a resource for building a house when the child eventually gets married. After marriage, women live with their parents until after the birth of the first child. The Dongs are ancestor-worshippers. They revere many gods and spirits. Certain trees, rocks and sites are considered sacred. The Dong is believed to practice Tu, a form of black magic, or a "kitchen god", which is worshipped during their spring and fall festivals. In the spring, they ask him for steady plant growth and in the fall for an abundant harvest. They also have a special reverence for a goddess called Sama (meaning "Great Grandma") for whom altars and temples are built in villages. The Dong are famous for their carpentry skills, and there are two structures unique to Dong society: the Drum Tower and Wind and Rain Bridge. The Drum Tower is the highest and most cherished building in the village, functioning as a place for public meetings as well as the center of social activity. The covered Wind and Rain Bridge (Fengyu Bridge) also serves as a meeting place, a rest area for weary travelers, and a shelter from bad weather. Dong villages have a uniqueness that separates them from those of neighboring nationalities such as the Zhuang, Miao and Yao. A drum tower, with its formation of tiered, multistory roofs, dominates the landscape of a typical Dong village. The tower, the tallest and most revered structure in the village, is constructed without nails, a testimony to the architectural skills of the Dong. A long drum, made of a hollowed tree trunk, hangs within the tower and formerly served as a warning device against invaders. In ancient days, villagers assembled here during times of strife to await orders from the heads of their clan. Today, the tower is where villagers congregate for festivals, special meetings, or just to relax and talk. In a large village, each clan may have its own drum tower. As a Dong saying goes, where there is a river, there must be a bridge. In fact, whenever the Dongs live in compact communities, there will be various bridges. The one that best reflects the Dongs' superb bridge-building techniques is the stone-based wood corridor bridge named Fengyu (wind-and-rain-shed bridge). It has several pavilions built onto it. The masterpiece of this style is in Chengyang, Guangxi. It is 64.4 meters long, 3.4 meters wide and 10.6 meters high above the riverbed. Five pagoda-like pavilions stand along it. The bridge is tile-roofed and flanked by wooden railings and stools, so it looks like a long corridor. Not a single nail or screw is used in the construction of the bridge; instead, the whole wooden structure is held together by mortise and tenon joints. According to the Dong people of southwestern China, "Songs nourish the soul as food does the body". 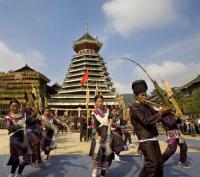 Dong people have long used songs as a means of recounting and preserving their history. The Dong have never had a writing language until the year 1958. And so before that the Dong culture, the Dong stories and history were recoded, really, by means of song. That's not literally recorded on cassette, but passed down from generation to generation. It's really a kind of Dong literature, an unwritten literature. In addition, Dong music has traditionally been used to negotiate social and individual events. There is music for working in the fields, music for offering wine to a guest and music for dating. Not long ago, eligible Dong bachelors would travel the local countryside and, through song, request permission to enter a girl's chamber. If she sang back an invitation, the men would be permitted to enter and the girls would judge them on their wit and talent, all through the antiphonal way. The Dongs' favorite musical instrument is the Lusheng, a wind instrument with a reed that has developed a fairly sophisticated form through the efforts of several generations of Dong musicians. Lusheng dance originated in a religious rite held before spring ploughing to pray for fine weather for crops and good harvests. Now it has become a very popular Dong recreation in which nearly a hundred participants dance to the music they are playing on the instrument. The men carry home-make musical instruments with them such as the Pipa and a buffalo-leg shaped stringed instrument to visit girls in stilt-legged wooden houses. When a young woman finds the partner of her heart, she beckons him in. Through the years this form of courtship resulted in happy matches.